Dive Journal: Janel is taking a short break from diving, so John uses her BC this morning. With each dive, John is getting more and more accustomed to clearing his ears and getting comfortable. With the better fitting BC, he makes some improvements to his buoyancy as well this dive. I have fun being John’s buddy this dive. As I wait for John to do his backroll, I see hundreds of thimble jellyfish in the water all around us! Cute little clear jellyfish smaller than a dime, with strange greenish interiors. They are so mildly toxic as to be benign to most skin – they don’t bother us at all.. There are very nice sponges to see on this dive, including some nice barrel sponges and encrusting sponges, but not too much fish life this morning. There are again schools of blue chromis who refuse to be photographed properly. Michael shoots some video of all three of us and we clown around a bit making faces. 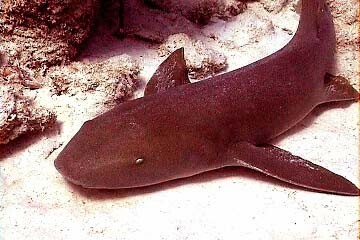 We then come across a decent size nurse shark. Linda and Michael trade the camera back and forth, and Michael slowly swims closer and closer to get some good video. He eventually touches the shark on its side, petting it. The shark doesn’t seem to mind too much, but slowly lifts and fins away from us., settling in a different nearby spot. We also come across a big barracuda hovering near the boat, one with darker colorations. Nice dive, John!